Fifty-eight years is a very considerable time frame in the life of any nation which was not founded on evil, mischief, fraud, and deceit, to have made a meaningful impact, at least, in charting a course for its navigation. This is because any nation, whose leaders have the thought of the wellbeing of its people at heart, will commence by drawing and specifically stipulating what it hopes to achieve within a particular time frame, and go ahead in the pursuit of the same through National Planning. Unfortunately, the satanic, parasitic, sadistic, exploitative, and predatory Britain that founded Nigeria, established Nigeria as a workshop for the execution of their evil agenda against Africa in general, and Biafra in particular. That evil British agenda is to continuously plunder Biafra, and systematically emasculate the nation of Biafra and Biafrans through denial, deprivation, implementation of nefarious and obnoxious laws, and consistent acts of state sponsored terrorism and genocide, as we have been witnessing in Nigeria, for more than a century. It is on the basis of this criminal foundation upon which Nigeria came into existence, that Nigeria remains an absurdity and abnormalcy, hence, the imbecility. It is this birth of Nigeria into imbecility that has naturally resulted in its stunted growth, having been conceived in sadistic brutality by the evil Britain. Any country or nation that has not defined its destination, or that is still contributory to the death of its own citizens, must be likened to that proverbial fool, who even at forty, is still a fool. Some days ago, Nigeria celebrated fifty-eight (58) years of "independence". It was very disheartening to find out that instead of the victims (who call themselves citizens) of Nigeria, to introspect, bewail, bemoan, and lament the calamity that has befallen them, by reason of the imbecilic stigma that has been attached to them for being identified as Nigerians, they were rather celebrating their wretchedness, celebrating their misery, their pauperization, and criminal entrapment, blockade and occupation. When one is even compelled to stop and take stock about the events, activities, and adventures that have taken place in the British inhumanity called Nigeria, since its existence, one cannot, but end up in severe pains in the heart, considering the fact that no single positive statistics are recorded in favour of the evil forest called Nigeria. Productivity and creativity - - - 0. There is nothing Nigeria can be proud of since 1960 till date except killings of her citizens and election rigging. As the Nigerians were busy mocking and ridiculing themselves before the world in the name of celebrating the charade called "independence" on October first, there were simultaneous killings in the Jos University campus and other areas of Jos, Plateau State, with government providing security for the murderers and terrorists. If state sponsorship of terrorism and genocide against certain sections of the country is the parameter by which greatness is measured, you can be sure that no other country will come ahead of Nigeria, since Nigeria remains about the only country that sends its army against its unarmed citizens to kill them in millions, without committing any offense, while aiding, sponsoring, applauding, and rewarding the terrorists wreaking havoc on the same citizens. It is because of the fact that Nigeria has become a breeding ground for mortifications (death) of various kinds that Biafra has not just found it pertinent, but equally urgent, to exit this toxic cauldron called Nigeria. Nigeria is a failed state. It is a country that breeds terrorists and cherishes terrorism. It is a country that spends billions of naira to give cover to Boko haram and Fulani herdsmen terrorists, but send Operation Python Dance to kill and maim unarmed innocent Biafrans with impunity. At 58, if a country cannot provide security and other social amenities for her citizens, then the sovereignty of such a country should not only be questioned, but should be equally withdrawn and scrapped. 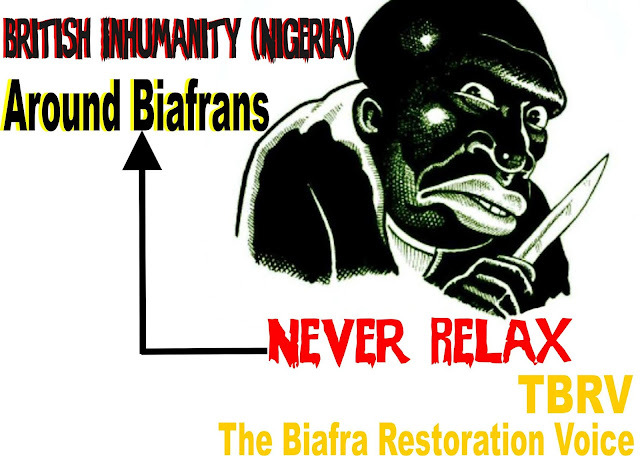 Therefore, Nigeria has failed and should allow peaceful exit of Biafra Republic. Nigeria has failed, because joblessness, corruption, killings, quota system policy of the government, election malpractices, injustice and bad governance are being celebrated and adored on every October first, against weeping, mourning wailing, lamentation, and deep sorrowing, which should have been the hallmark of those who are still retaining their sanity, in view of the stunted growth, or outright nightmarish epileptic state, in which the evil entity they have been forced to identify with as their country, found itself. This year's October first Imbecility Day was a celebration of the endless mass grave gifted to the people by the atrocious government of Jubril Aminu of Sudan, who has been impersonating the late Mohammed Buhari, leading the team of the terroristic gangsters at Aso Rock, on the stipulation of the satanic Britain, the owners of the fraudulently concocted contraption and criminal enterprise called. So, as the people of the middle belt are still mourning their loved ones being hacked to their early graves by federal government through their Fulani herdsmen militia, Biafrans are demanding the immediate desolution of this evil forest called Nigeria and to let the component nations go their separate ways, for the sake of peace.